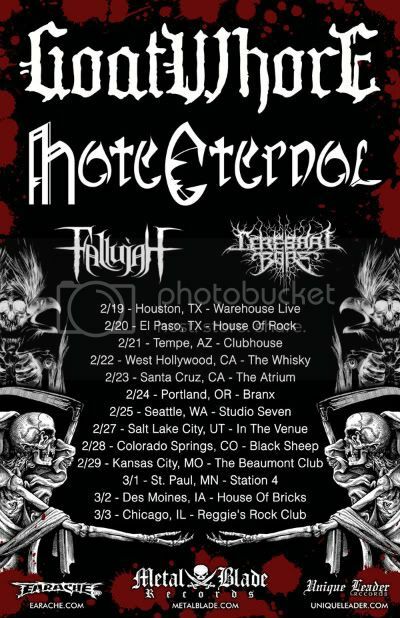 Label mates GOATWHORE and HATE ETERNAL will be hitting the road on February 18th for a several week co-headlining tour. The supporting bands on the tour will be FALLUJAH and CEREBRAL BORE. The tour will take the bands from New Orleans to Brooklyn, with stops along the way in Hollywood, the Pacific Northwest and Canada. Goatwhore will release their new studio album, entitled Blood For The Master, on February 14th in North America via Metal Blade Records. The band previously issued the following video update from Mana Studios in St. Petersburg, Florida where they recorded the new album with Erik Rutan; who also produced the band's previous two efforts, A Haunting Curse and Carving Out The Eyes of God. 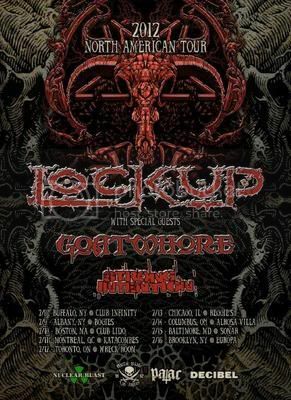 Extreme metal supergroup LOCK UP - featuring singer Tomas Lindberg (AT THE GATES, DISFEAR), bassist Shane Embury (NAPALM DEATH, VENOMOUS CONCEPT), drummer Nick Barker (ex-CRADLE OF FILTH, DIMMU BORGIR) and guitarist Anton Reisenegger (PENTAGRAM, CRIMINAL) - have announced a North American tour with support from Goatwhore and STRONG INTENTION.